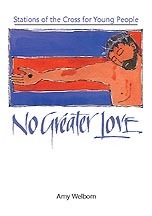 A few years ago, I wrote a Stations of the Cross for young people called No Greater Love, published by Creative Communications for the Parish. No Greater Love is no longer in print, but I've been receiving inquiries about it, so since it's out of print, and I hold the rights, the publisher has agreed that it would be fine for me to distribute it as I wish. So, if you'd like to download it, make copies for your teens or group, feel free. You can download the pdf file by clicking here. It's not in a booklet form - just 9 pages, basically. But perhaps you can use it. Also, thinking ahead to First Communion, Confirmation, Graduation, Mother's Day, Easter Vigil.....here are some books for sale.